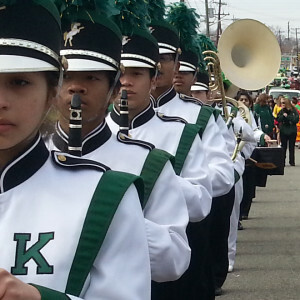 The JFK Marching Mustangs perform at every varsity football game, home and away, as well as numerous competitions and parades throughout the year. They are John F. Kennedy Memorial High School’s most visible ensemble. For the past 25+ years, the Marching Mustangs have been the only band to lead Santa Claus’ arrival at the Woodbridge Center Holiday Parade. In 2012 they were selected to perform in the Centennial Cherry Blossom Festival Parade in Washington D.C. The Marching Mustangs have performed around the world in places such as Boston, Florida, Ireland, Myrtle Beach and in the Electric Light Pre-Parade down Main Street in Magic Kingdom Park at Walt Disney World. This past April, the Marching Mustangs performed at Epcot Center in Walt Disney World. Now in their 54th season, the Marching Mustangs will be performing their field show, “Shuffle,” this fall. There is no audition requirement to participate in general, however certain spots (snare drum, bass drum, color guard, etc.) do require an audition. Unlike the other ensembles at JFK, 8th graders are eligible to join the Marching Mustangs. Participating in the Marching Mustangs is a large commitment, however the rewards are even larger. Apart from making lifelong friends and experiencing the epitome of teamwork, students are eligible for a varsity letter after two years of high school participation. Contact Mr. Cabrera about membership opportunities.